I have never been one to work my reeds with tools much. I am more inclined to throw away a misbehaving reed than fight with it by trying to balance, shave, trim, or thin it. To me it is easier and more efficient with my time to just take another reed out of the box. Plus, I have a greater chance of gaining a playable reed by taking a new one than try to perform surgery on a bad one. Lots of players do not mind reed working and many of them actually like it. Cheers for them. Even if you hate working reeds, there are some obligatory tools you will need to put in your sax case. 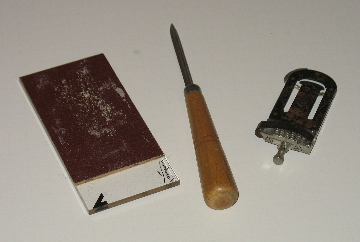 These include the resurfacing plate (or use fine grit sandpaper), reed knife, reed clipper—sometimes called a trimmer—and reed rush. The resurfacing plate is for evening and/or thinning the reed from the table side of the reed. Never use a resurfacing plate on the top or vamp side of the reed. To sand the top of the reed use a small piece of fine grit sand paper. To bring the vamp or heart down, or balance a reed, use either a reed knife or rush. Use strokes toward the tip. Rush can sometime crush in the process even when wet. Also, the ribs on rush can be inconsistent. It is not uncommon to buy a box of rush and not want to use a third of it. After a reed becomes geriatric or a small crack in the tip occurs, it can be given a little more life by clipping or trimming the tip. Do not try to sand the tip! Use a reed clipper. Strap the reed in the trimmer and make sure the sides are even. Draw the tip up with the adjustment screw so only a sliver of the tip shows on the back side of the clipper. Snap the lever to remove some of the tip. Play test the reed. If it blows hard, especially in the low register, it may need some sanding. Do not clip a reed twice. If it cannot play after one clip, send it to its eternal rest.